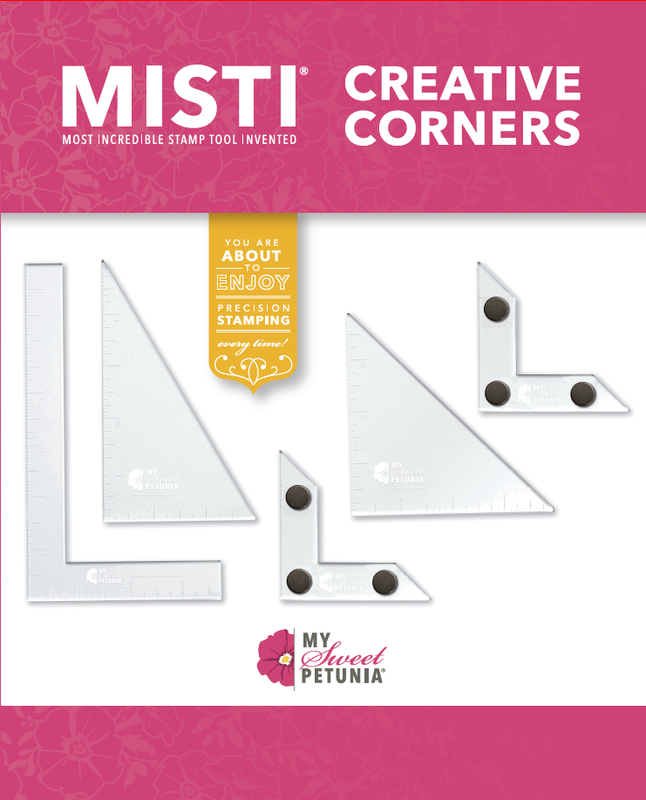 I am so excited to tell you about our newest product.... Creative Corners. I have had these under wraps for the last year, and it's been a hard secret to keep! It has literally taken me an entire year to present these to you. I had to go through several sizes and magnets to finally settle on the perfect set of Creative Corners. The possibilities for these MISTI accessories is endless. Here are just a few things you can do with the Creative Corners. Thanks so much for stopping by and I hope you love the Creative Corners as much as I do! As an inventor, I can say the most fun moments for me are when I see what YOU do with our products. I look forward to your ideas! I've just seen your video!!! I love this kit!!! Wow!!! Awesome!!! Well, my gosh, you are good at secrets! This is amazing!! Great video love all the things you can do with the creative corners. Thanks for the demo and showing me why I really need this! I was excited to hear abt the creative corners, I know I'll be ordering. I'm amazed when I think back over how the Misti has changed the way I stamp, & I'm sure the entire stamping world. Kudos to you Iliana, & I'm so happy for your success! These are just wonderful. I have some handmade ones which worked just fine but your new ones are so much better - the magnets inside are genius! The whole set is certainly worth getting to make using the MISTI even easier. Love it. The plaid is awesome. You have made the MISTI an even more incredible tool. Thanks. I have the bigger misti so I think these will be a great addition to improve versatility! Great idea! STUNNER!!!!! Thanks so much for creating these useful tools! This Creative Corner accessory is awesome! It solves some problems I was having. . Love ❤❤❤ how you quickly created the plaid background! Wow! You are awesome, Illiana! I hope to get the the Creative Corners product soon. Blessings to you as you continue to develop new products to use with the Misti. This is awesome can't wait to add it to my Misti! These are awesome, Iliana - thanks for always thinking of new & great ideas for us to use our Mistis! BTW - what is that large floral stamp you used - \9w+9\\\\\\\\\\\/ maybe|? it is goregeous! Great video! I never would have thought of that method to make the perfect plaid! Now I'm off to try it. I never would have thought the MISTI could get any better than it was, but you did! I'm glad I purchased these creative corners. Can't wait to see what you come up with next! Awesome this kit is a must have! Thank you for creating the Misti!!!!!!! Fortunately for me, you made a video giving me ideas how to use your new creation, my imagination is not as huge as yours (lol) ! My pre-order is already done.... let's hope the postal services will work quickly ! Oh you do have the most brilliant mind!!! Congratulations once again!! Can't wait for the straight line especially! Triangles will be fun too! Love the straight line! And the triangles will initiate some creativity! Very cool MISTI accessories! I enjoyed your video about how to use these. Awesome! Definitely ordering! Thank you! If not for the video, I'd be asking why I would buy? Now I understand. Very nice! TFS. Need to subscribe to your videos.